I was sick the entire week last week, so I had to drag myself to work daily. You know how difficult it is to be sick – the fact that your child might catch also catch your sickness adds to the stress. Ugh! I seldom get sick, by God’s grace (thank you, Lord!). And when I do, it doesn’t take too long. This is one of the longest I had; actually, the longest I could remember was when I was in Grade 6 when my brother and I had to be admitted to the hospital due to dengue fever. This started last Sunday and I completely ignored it ‘coz I thought it would just be gone, or just a little itch on my throat. Came Sunday evening and it was gradually getting worse so I gargled with Bactidol. Monday shift came and I knew I was having sore throat, on top of that, I was having migraine! What a great way to start the week! Lol. The following day, I asked my bro-in-law to buy Strepsils and another bottle of Bactidol. Tuesday came and it started to heal, Wednesday, along with my sore throat being healed, came a new illness: colds which continued ‘til Saturday with cough. If there’s something I am thankful for during those times, it was the fact that I didn’t have fever. 1. For sore throat – I can always rely on Bactidol and Strepsils. Before I had these two available, I’d gargle using warm water with salt, which also helped soothe the pain somehow. But I had to do it every hour. 2. For colds – The worst part of colds is the feeling of having clogged nose! I used a little pail half-filled with hot water and I put either Vicks VapoRub or even Efficascent oil and I’d put towel on my head and put my head on top of the hot water, just far enough that I don’t feel really hot so I could smell the mentholated scent. It helps a lot in relieving the pain. I also used Neozep for it to heal faster. 3. For cough – I took Solmux to help me with my dry cough. Thankfully, it didn’t last long, just about 3 days. On top of all these, there’s an effective natural remedy that Dane and I have been using ever since: Pure Calamansi Juice, it’s a great source of Vitamin C to boost immunity. So for 4 consecutive days last week, I’d buy ¼ kilo of Calamansi, extract the juice, take the seeds out, add a very little water and drink it. It’s super sour and also painful on the throat, but it helped me a lot! 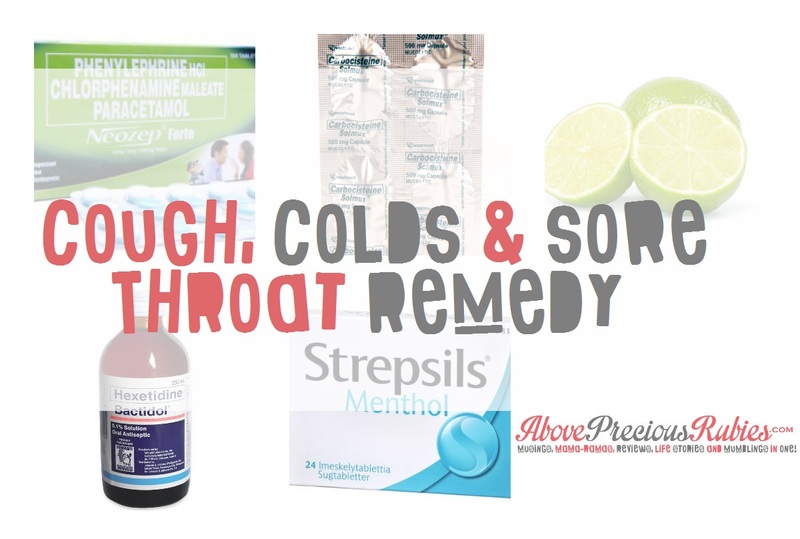 What’s your home remedy for colds, cough and sore throat? It's really hard to get sick when you are parent because you don't want your children getting sick too. Good thing you are feeling better now. Good choices of home remedies too. Glad to hear you're feeling okay now. We always have Bactidol at home, too, for when our young man would suffer from sore throat. For colds, we only use Muconase nasal spray for him. He seldom has cough, so we rarely buy and store cough meds at home. Sore throat is also a sign for me that I would be getting colds. I also use Bactidol. Sometimes it works. Sometimes it does not. Glad to know you are now feeling better. Aw, so sorry to hear that sis. I agree! That's number 1! I've never tried nasal spray before. But yes, Bactidol is definitely good for sore throat. Yes, same here! Thanks, I am so much better now. Actually, not sick anymore! Awts, get well soon! I didn't know calamansi juice can be used sa mukha! I should try that out! hehe.